It’s one thing to have married authors who jointly write science fiction romance stories (e.g., Sharon Lee & Steve Miller). It’s altogether something else to have married authors who each write sci-fi romance tales that take place in separate universes and whose releases are mere months apart. What are the chances of that happening? Upon learning about the releases of Nico Rosso’s TAKEN TO THE LIMIT (2010) and Zoe Archer’s COLLISION COURSE (2011), I added them to my TBR list. At one point, I discovered that Zoe Archer and Nico Rosso are married. That’s when I knew that I had to go there: I developed a strong curiosity about how COLLISION COURSE and TAKEN TO THE LIMIT would stack up against one another. Yes, it’s true! Simply because these two authors are married, I felt compelled to compare and contrast a few elements from their respective sci-fi romance releases. Wouldn’t you? Right! Knowing others might have the same curiosity (:P), once I finished both space opera novellas, I decided to arrange the sci-fi romance bout of the decade (without spoilers, of course). All in good fun, eh? LET’S GET READY TO RUMBLLLLLLLLLLLLLLLLLLE! TAKEN TO THE LIMIT features futuristic super soldier Sergeant Morrow. He’s an elite “Nightfighter” veteran of the Limit War. COLLISION COURSE’s Mara Skiren is a scavenger, loner, and outlaw by nature. Plus, her ship is named the Arcadia. TAKEN TO THE LIMIT’s Korina Antonakis is an ER doctor who gets a crash course in the art of war. In this case, nature wins out over nurture. With a secret war raging between two alien races on Earth, TAKEN TO THE LIMIT ramps it up to eleven with wall-to-wall action. Since Mara and Kell are on a rescue mission in COLLISION COURSE, they spend a fair amount of time zipping across the galaxy in a space ship. Videogame-style shoot ‘em ups are pretty rare in sci-fi romance and therefore a unique experience. Round 4: Which Romance Reigns Supreme? 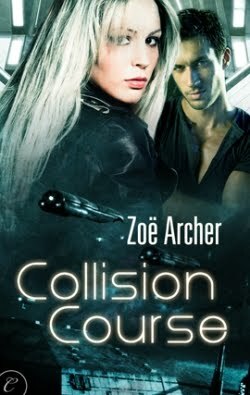 In COLLISION COURSE, a significant amount of the plot is devoted to developing the relationship (not to mention some serious sexual tension). Mara and Kell both have a number of issues to work through before trust is achieved. TAKEN TO THE LIMIT treats us to fun—if fantastical—shape-shifting armor. Guns shift in size depending on need, and body armor adapts to multiple environments (e.g., battlefield, space). How exactly is this possible? Who cares?! In COLLISION COURSE, biotech implants allow Black Wraith pilots like Kell to mind link with his ship. The singularity angle is neat, but a limited aspect of the story. 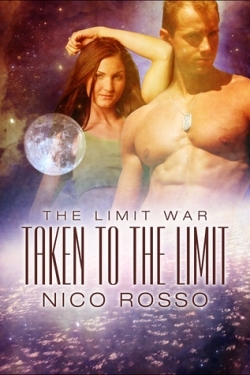 TAKEN TO THE LIMIT contains efficient, sizzling love scenes. Mix zero sexual inhibitions, adrenaline highs from battle, and a psychic mind link, and you get an idea of how impossible it is for Morrow and Korina to keep their hands off one another. COLLISION COURSE has more of a slow build when it comes to Kell and Mara’s physical intimacy. But their mental lusting and sexual tension stoke the flames so intensely it’s like going on an appetizer splurge. TAKEN TO THE LIMIT has a military SF setting (the action takes place primarily on Earth) and embraces it with open arms. The details provided are interesting, but the story’s narrow scope is a little too lean given the massive ongoing war that’s referenced. On the other hand, some readers may find the utter lack of infodumps a plus. This one is for fans of videogames like MASS EFFECT, films like STARSHIP TROOPERS and TRANSFORMERS, or SF anime with transforming mecha. COLLISION COURSE has a space opera setting and gives the impression of an older, established galactic neighborhood where different races and cultures have taken root. This is one for fans of STAR TREK, FIREFLY, FARSCAPE, etc., given the story’s higher number of setting details. Ladies and gentlemen, I do believe it’s a tie between COLLISION COURSE and TAKEN TO THE LIMIT. Each story offers unique elements, and I hope this event helps you choose which one suits your tastes the best.